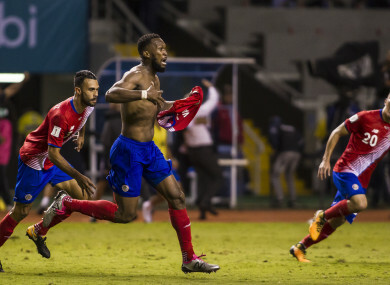 COSTA RICA BOOKED a spot at the 2018 World Cup after a dramatic late equaliser against Honduras on Saturday. A powerful header from Eddie Hernandez put Honduras in front in the 66th minute in the World Cup qualifier in San Jose, in a clash pushed back a day due to Tropical Storm Nate. But there was late drama as the home side levelled in the fifth minute of additional time, Kendall Waston rising highest to head in a Bryan Ruiz cross. With one match remaining in CONCACAF qualifying, the point sealed Costa Rica’s spot in Russia. Costa Rica (16 points) will finish second to Mexico (21), with those as the only two CONCACAF sides to have booked their tickets to Russia. It marks the fifth time Costa Rica have qualified for the World Cup, having reached the quarter-finals in Brazil in 2014. They became the 13th team to qualify for the 2018 showpiece, joining Russia, Brazil, Iran, Japan, Mexico, Belgium, South Korea, Saudi Arabia, Germany, England, Spain and Nigeria. The draw also sees Panama remain in the playoff position in CONCACAF on 10 points, level with Honduras which could have jumped up to fourth had the side been able to hang on for the win. The United States currently occupies third place in the table after beating Panama 4-0 on Friday night, which leaves Bruce Arena’s side in control of its own destiny heading into the final match of the Hexagonal. With just two points between the three sides fighting for the final automatic berth from CONCACAF and one playoff place, there is still plenty to play for on the final matchday. The USA will be on the road against Trinidad and Tobago, with Honduras hosting Mexico and Panama hosting Costa Rica. Email “Absolutely brilliant bedlam as Costa Rica qualify for World Cup after last-gasp leveller”. Feedback on “Absolutely brilliant bedlam as Costa Rica qualify for World Cup after last-gasp leveller”.